← Saturday Steals. Get Shopping! I might have missed a week – did I? In the scurry of Christmas and craft shows and job search I have lost rack. But I have some fantabulous books you will want to Pre Order! A large portion of the books being released the week of the 23rd are ‘diet’ books and some cookbooks. Since I recommend books I can only recommend one and this is available 12/17/13. by Deborah Madison with Contributors. Available 12/17/13. See below for more upcoming releases. 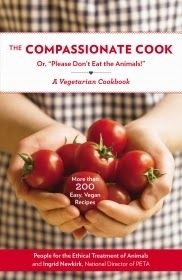 Right now I recommend, though not new releases, the following books from PETA. Start 2014 off by making an ethical choice or just because vegetarian is a healthy lifestyle. New from the Who Was Series available 12/26/13. The Nelson Mandela book has been released early as an E-book. The paperback will be available 1/9/14. The Who Was Series is wonderful and targeted for Grades 3 to 7. Get Started: Crochet by Susie Johns. Available December 23, 2013. Get Started: Crochet teaches beginners basic stitches and shows how to start crocheting with 20 easy projects, including hats, blankets, and baby clothes. Perfect for beginners who want to learn a new craft, DK’s Get Started: Crochet takes a “do and learn” approach by starting simple and building new skills, using photographed techniques to help people learn step-by-step. I love to crochet and perhaps this book will serve as an introduction to an enjoyable craft. For nerds like me, an immense 2 volume non-fiction. Papers, Literary, Scientific, Etc. (Cambridge Library Collection – Technology) (Volume 1) and Papers, Literary, Scientific, Etc. (Cambridge Library Collection – Technology) (Volume 2) by Fleeming Jenkin, Sidney Colvin (editor). Available December 28, 2013. An electrical engineer, university teacher and wide-ranging writer, Fleeming Jenkin (1833-85) filed thirty-five British patents in the course of his career. Edited by Sidney Colvin (1845-1927) and J. A. Ewing (1855-1935) and first published in 1887, this two-volume work brings together a selection of Jenkin’s varied and engaging papers. The collection ranges from notes on his voyages as a marine telegraph engineer, to a critical review of Darwin’s On the Origin of Species, essays on literature, and thoughts on technical education. A memoir written by Robert Louis Stevenson, his former student, provides biographical context and attests to Jenkin’s many interests and talents across the arts and sciences. Volume 1 begins with Stevenson’s memoir, incorporating Jenkin’s records of his voyages. This is followed by writings on literature and drama. Three pieces on scientific subjects, including the review of Darwin, conclude the volume. And for the even dorkier people like me here is something already released that you may love. Papers, Literary, Scientific, etc. This is a pre-1923 historical reproduction that was curated for quality. Quality assurance was conducted on each of these books in an attempt to remove books with imperfections introduced by the digitization process. Though we have made best efforts – the books may have occasional errors that do not impede the reading experience. We believe this work is culturally important and have elected to bring the book back into print as part of our continuing commitment to the preservation of printed works worldwide. This text refers to the Bibliobazaar edition. Chasing God by Angie Smith. Kindle edition available now. Hardcover Available January 1, 2014. But you aren’t convinced you really know Him. Angie Smith understands, because she had run circles around the same paths searching for Him, frustrated at her lack of progress. And she probably would have continued to do so had it not been for one realization that changed everything.